A Fran Kirby hat-trick booked Chelsea’s place in the semi-final of the FA WSL Continental Tyres Cup as they beat Liverpool Ladies 5-1 at Kingsmeadow. The striker gave her side the lead in the opening minutes after latching onto a clever through ball from midfield. 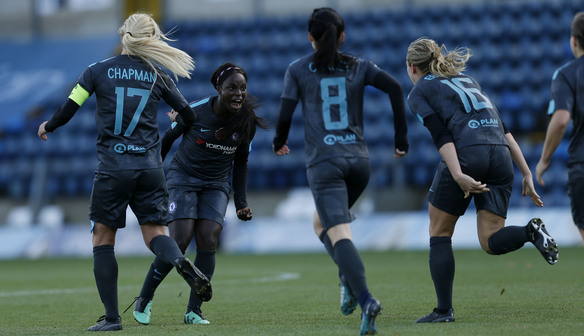 And Chelsea, who are so far unbeaten in domestic competition, took control midway through the first-half with two goals in quick succession from Ramona Bachmann and Kirby. Liverpool pulled one back in the second half through Casey Stoney, but it was only to be a consolation, as goals from Kirby and Erin Cuthbert put the game beyond doubt. Kirby gave Chelsea the lead in the fourth minute, holding off a defender and slotting into the bottom corner after a chipped through ball from Ji So-Yun. The home side doubled their advantage in the 23rd minute through Bachmann, who rounded the keeper after latching onto a long ball over the top. And just one minute later Kirby profited from a similar ball through before firing her shot past Siobhan Chamberlain in the Liverpool goal. Liverpool started the second half well and were rewarded in the 51st minute through Stoney, who headed into the bottom corner from a corner. But all hopes of a comeback were soon crushed by Kirby, who tucked home her third from close-range before being withdrawn. Substitute Cuthbert then capped off Chelsea’s dominant display in the 78th minute with a curling effort from the edge of the area to guarantee her side’s place in the semi-final. Liverpool manager Scott Rogers said: “I don’t think we started the game well and you’re always up against it against a top team like Chelsea - we started slower than we wanted to and were punished by a top team. “We said to them at half-time that we needed to be a little bit braver and take some more risks, it is a cup-tie. But first and foremost we needed to use the ball better I don’t think we did that enough in the first-half and sometimes our girls are very good technically, but for whatever reason we didn’t want to pass the ball in the first-half, which played into their hands. “They’re a very good side and we’ve been punished today. “As a group we were much better in the second-half and performed more to the level that we are accustomed to seeing. Chelsea’s Fran Kirby commented: “Our movement up front was fantastic. We were disappointed to concede a goal but overall we’re really happy. “In the last few months I’ve definitely found my form again. Mentally and physically I’m in the best place that I can be at the moment but I still know that I’ve got more to give. “Every player can improve and I just want to keep doing well for club and country. “We came out here a little bit fresher than if we did have a game last week. We have to take each game as it comes, it’s not like we went sloppy because we didn’t have a game. “In the first-half we were really dominant. They were a threat from set-pieces but we knew that. We were disappointed to concede a goal but at the end of the day we knew they probably weren’t going to score three goals against us.